The Pacific Northwest was once home to the greatest salmon runs in the world. 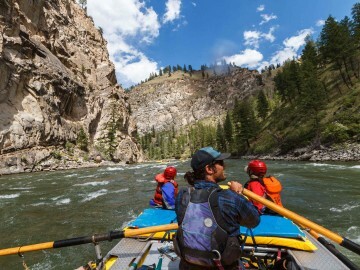 Idaho’s Salmon River, named for the iconic fish that used to return to this rugged, high-elevation landscape in droves, was the beating heart of salmon country. Lewis and Clark wrote about the rivers and streams of Idaho being so thick with wild salmon that you could walk across their backs. So why, in the largest and best-protected wilderness in the lower 48, are salmon and steelhead on the brink of extinction? Why did 97 percent of Idaho’s sockeye perish before making it home to their natal streams? Many factors, but none play as large of a role as dams. Idaho’s salmon run a gauntlet of eight major hydropower dams, four on the Columbia and four on the lower Snake River. The lower Snake River dams were built towards the end of the dam-building era to turn the town of Lewiston, Idaho, into a sea port. While the Army Corps succeeded in allowing access for barges, these four dams caused a precipitous decline of wild salmon and steelhead in the Snake River Basin, driving some species to extinction within a couple of decades and landing the rest on the Endangered Species List. Not one has come off the list since, despite federal agencies spending more than $15 billion on recovery efforts. In short: They were the dams that broke the salmon’s back. 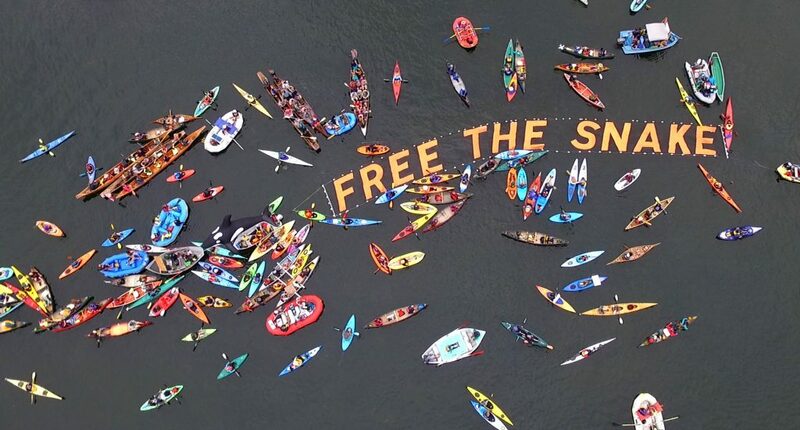 A growing coalition of people from across the United States are making it clear that it’s time for the lower four Snake River dams to go. 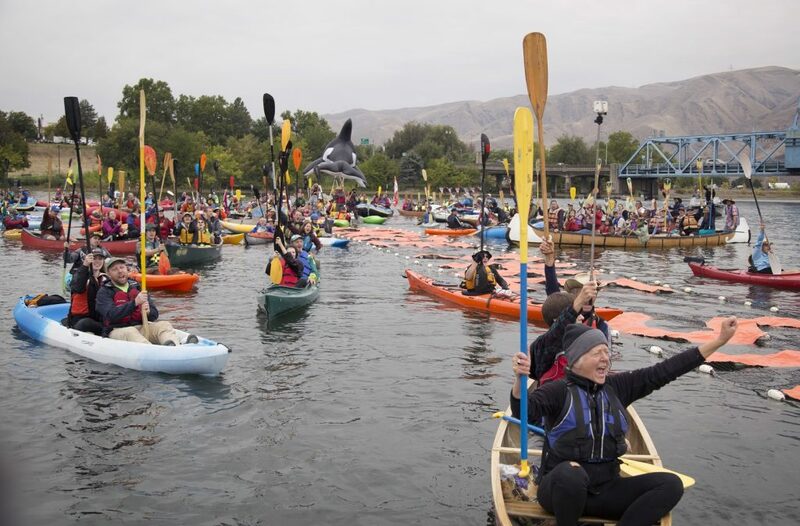 In late September more than 300 people took to the lower Snake River outside of Lewiston for the Free the Snake Flotilla. 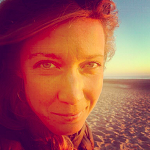 Why save salmon in the Snake River Basin? These fish are special. 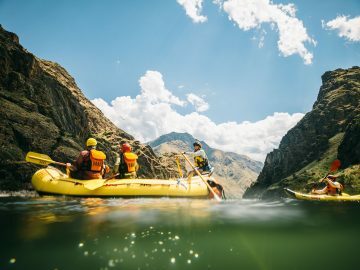 Idaho’s Snake River sockeye travel farther and higher than any sockeye on the planet—climbing 7,000 feet in elevation and more than 1,000 miles inland to their homewaters. They are irreplaceable to more than 140 species, including bears, wolves, eagles, Puget Sound’s orca whales—and human communities. Not to mention throughout their lifecycle salmon support an entire ecosystem, so much so that scientists have found salmon DNA in trees miles from streams. What about energy? Solar and wind is booming, and with energy efficiency, replacing the limited energy capacity at the dams is not just possible, it’s a smart move toward a brighter clean energy future. And barging? Barging at the dams has declined more than 70 percent in recent years. Not to mention, a railroad runs the entire length of the river. In short: these dams cost the region and American taxpayers far more than the benefits they produce. 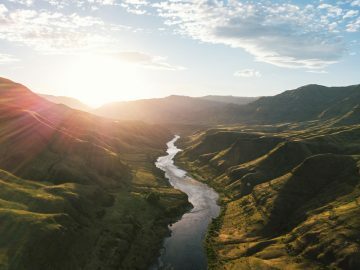 Scientists are also pointing to the upper Snake River Basin as a refuge for wild salmon and steelhead in the wake of climate change. These fish are survivors and if you give them half of a chance, they will come back. We’ve seen it on the Rogue, and on the White Salmon and Elwha Rivers. 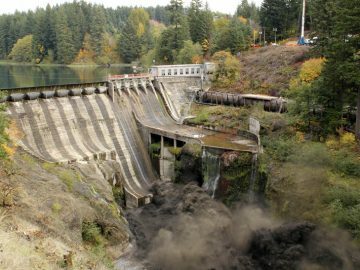 Remove deadbeat dams, and salmon return in force. 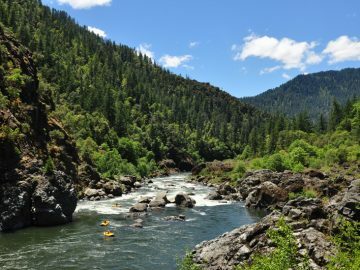 After the successful removal of two dams on the Elwha River, the largest river restoration in history (so far), and with plans in motion to remove four dams on the Klamath River in 2020, it’s clear we’re in the midst of a sea of change and a growing understanding that some dams no longer make sense and that removing them actually provides huge benefits for fish, local communities and economies. 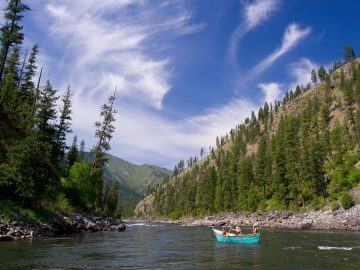 Between now and January 17, federal agencies are taking public comment on the fate of the lower Snake River. Fired up? Speak up for wild rivers and salmon. 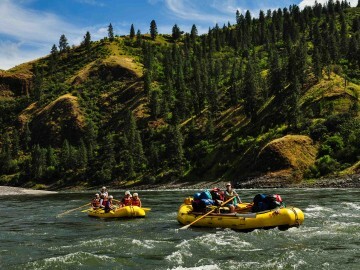 Did we mention that there are 70 named rapids under the lower Snake River reservoirs?